This post is for mainly for my engineering colleagues. Over the years I have had many discussions to explain the difference between Machine-to-Machine (M2M) or Machine Type Communication (MTC) as 3GPP refers to them and the Internet of Things (IoT). Even after explaining the differences, I am often told that this is not correct. Hence I am putting this out here. Please feel free to express your views in the comments section. In this case a facilities person has to manually go to each of the floor and check if there are enough coffee beans, chocolate powder, milk powder, etc. He/She may have to do this say 3-4 times a day. 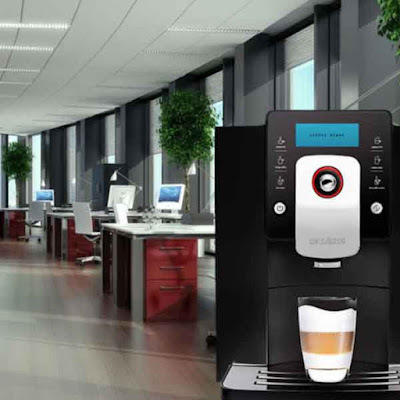 Lets say that the coffee machine is connected to the office system and database. It knows which employees come when and what is their coffee/drinks consumption pattern. This way the machine can optimize when it needs to be topped up. If there is a large meeting/event going on, the coffee machine can even check before the breaks and indicate in advance that it needs topping up with beans/chocolate/milk/etc. If we take the coffee machine from scenario 3 and add intelligence to it, it can even know about the inventory. How much of coffee beans, chocolate powder, milk powder, etc is in stock and when would they need ordering again. It can have an employee UI (User Interface) that can be used by employees to give feedback on which coffee beans are more/less popular or what drinks are popular. This info can be used by the machines to order the supplies, taking into account the price, availability, etc. In many cases, API's would be available for people to build services on top of the basic available services to make life easier. Someone for example can build a service that if a cup is already at the dispenser and has been there for at least 2 minutes (so you know its not being used by someone else) then the person can choose/order their favourite drink from their seat so he/she doesn't have to wait for 30 seconds at the machine. If you think about this further you will notice that in this scenario the only requirement for the human is to clean the coffee machine, top it up, etc. In future these can be automated with robots carrying out these kinds of jobs. There would be no need for humans to do these menial tasks. 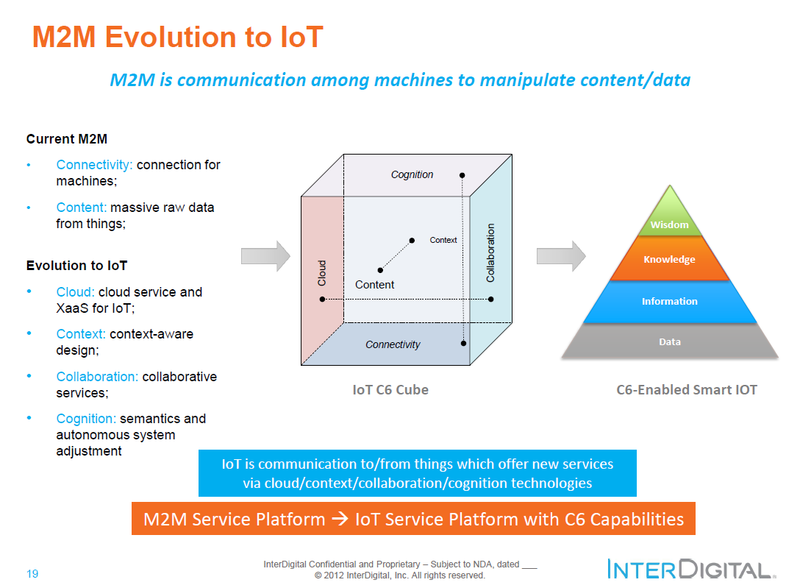 I really like this slide from InterDigital as it captures the difference between M2M and IoT very well, especially in the light of the discussion above. IoT is Communication to/from things which offer new services via cloud / context / collaboration / cognition technologies. Phil Sheppard, Director of Network Strategy & Architecture, Three UK was the keynote speaker of LTE Voice Summit held in London this month. Its been over a year that Three launched its VoLTE service in the 800MHz band. In fact recently, it has started showing adverts with Maisie Williams (Arya Stark from Game of Thrones) fighting black spots (not spots) with 4G Super-Voice. It was a huge project, the scope far exceeding original expectations and affecting almost every part of their operations. 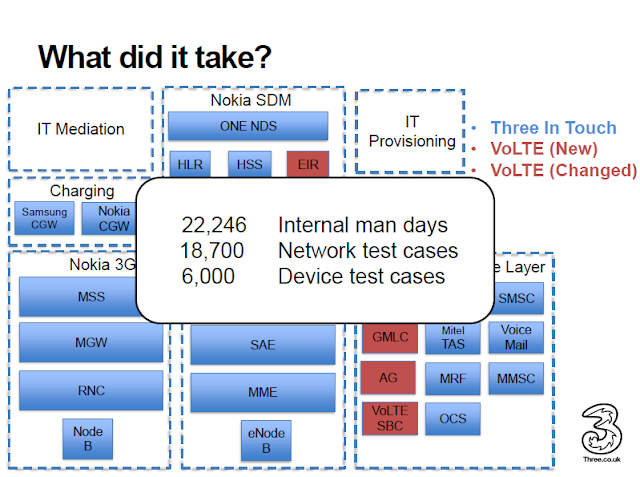 They spent 22,245 man days (excluding vendor staff time) – more than 100 man years of effort – mostly involved with running huge numbers of test cases on the network and devices. There are plans to roll out VoLTE in other bands too once all niggles are ironed out in the 800MHz band. Whats up with VoLTE Roaming? 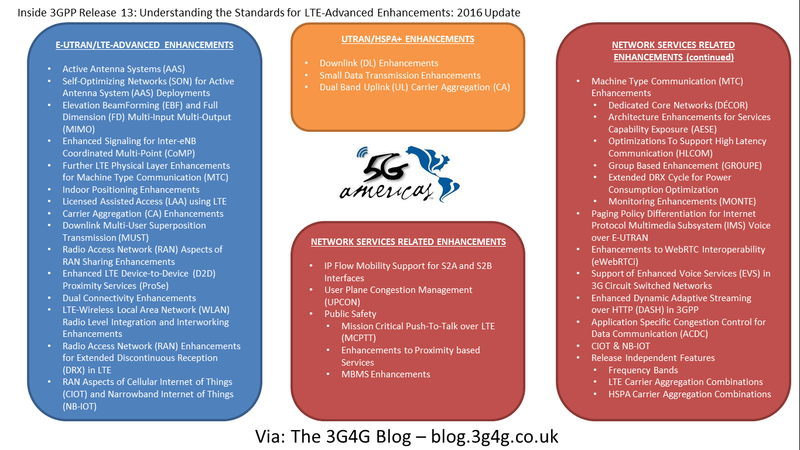 I have been covering the LTE Voice Summit for last couple of years (see here: 2015 & 2014) but this year I wont be around unfortunately. Anyway, I am sure there will be many interesting discussions. From my point of view, the 2 topics that have been widely discussed is roaming and VoWiFi. 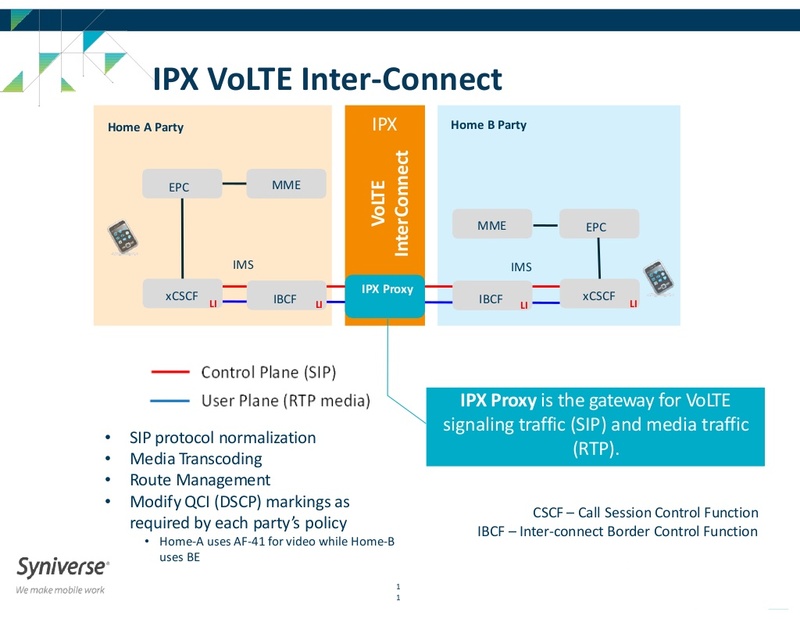 One of the criticisms of VoWiFi is that it does not the QoS aspect is missing, which makes VoLTE special. In a recent post, I looked at the QoS in VoWiFi issue. If you haven't seen it, see here. 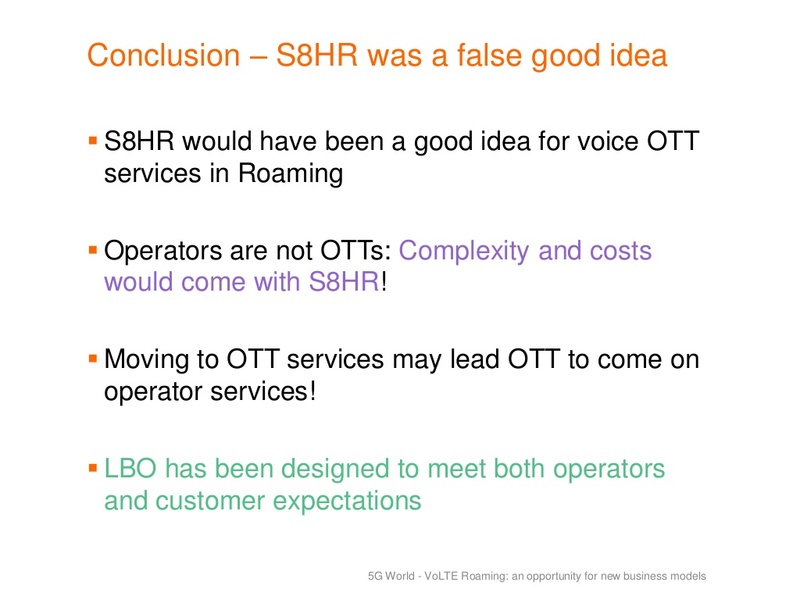 Coming back to VoLTE roaming, I came across this recent presentation by Orange. 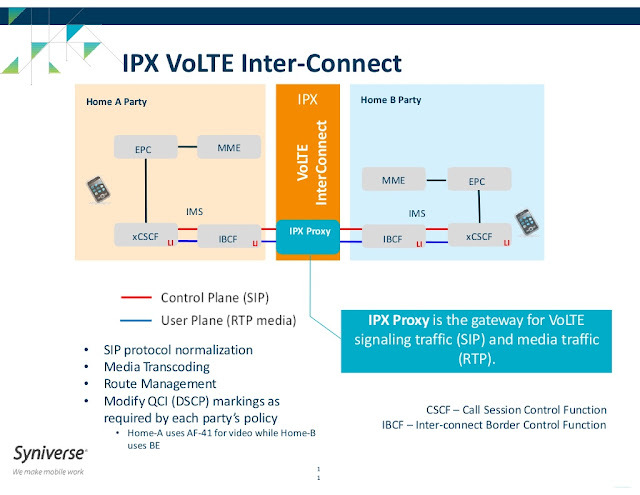 IPX is already in use for data roaming today and acts as a hub between different operators helping to solve inter-operability issues and mediating between roaming models. It can work out based on the calling and callee party what kind of quality and approach to use. Hopefully the LTE Voice Summit next week will provide some more insights. I look forward to hearing them.